So, remember when I told you that I had taken everything out of my living room in order to re-evaluate the purpose of that front room, formerly known as our living room? When we last talked about it, this is what the room looked like (below). It was empty and waiting for a new direction and carpet removal. Things are evolving! We still have a ways to go and there are other updates to come, but we’ve definitely made great progress! Thanks again to Lowe’s for working with me on the installation of those beautiful Hickory floors. So where are we going with this project and why? I want to live intentionally in my own home. Even though we have a “front room” that is labeled “living room” on our house plans, it doesn’t mean we have to call it our living room or use it like one. The truth is, we’ve discovered we don’t need a traditional living room. We don’t live in that front room. We pass through it, like a big hallway on the way to our dining room and kitchen. We need to create a home that suits our own lifestyle and needs. We need a home that works for us rather than suffocates us. For over three years I’ve been assessing the needs of our family in this home. I’ve watched how we live here and where we tend to hang out. I’ve observed where our messes tend to pile up and how I feel when I walk through my front door or walk down my staircase every morning. I’ve noted which rooms are not really used and which ones have too much going on in them to be practical. And now, I’m making changes all around my home to create spaces that we not only love to look at but spaces we love to come home to. Yes, it might appear there are a lot of projects going on at once and that might unnerve you at your house. Sometimes it has unnerved me too. But honestly, considering the house as a whole and taking action as a whole was necessary because all the pieces needed to fit together. I needed to shake up the whole house and put it back together again how I wanted it. It was time to make this house my home. Change is not easy. Getting the flow of your home right takes time. Reorganizing causes new messes. And yes, it can cost some money. but it can be done on a budget and over time. As you can see, many of these projects have been going on for awhile. My home and budget is not perfect or ideal, but that is part of the fun of this process. I actually enjoy working with my limitations because it forces me to be creative in my approach. My rooms are not complete in some overnight magical before and after weekend makeover. It is clearly a step by step process that takes place over many months and years to refine where we live and gather the things we love. I thought a lot about what I wanted to see when I came through the front door. Do you ever stop to think about what you see when you walk into your home? Our living room is wide open to our entry, immediately connected to the left of our front staircase right by our front door. We have a separate connected entry, but it is quite small. While our living area could easily be transformed to a highly functional craft room, an office or a dining room, I decided I didn’t need or want any of those spaces. I wanted the room to be useful in a different way than just practical. I wanted this room to be creative and visual therapy for me when I walk through! And in order to sense that, I needed to be very selective about what this room could become. I knew I really didn’t want my pile of projects to be the first thing I saw when I entered my home. I know myself and my family too well. We need craft and work spaces that are not in plain view of the front door. Eh hem. Let’s just say seeing our crafts or projects spread out all over the living room would make mama very cranky. Mama does not want to be cranky. I decided that I wanted to come home to something pretty, something spacious, colorful and yet peaceful. I wanted a room that set the tone for our home, for our day and our life at home. Basically, I wanted to have more room to breathe and celebrate being home. No paper clutter allowed. I wanted to walk down my staircase every morning and feel happy and energized, not claustrophobic or overwhelmed by projects or messes greeting me at the bottom of the stairs. 1) room to breathe so we can expand into an additional dining space when we have dinner parties or family holidays. I wanted a room that could be a gathering place as our friends and family come and go from our home. Basically I wanted a bigger entry and extra space for my dining room! So that is what we are going to have! I didn’t want to move my dining room to the front of the house, which was another option I considered, because I really fell in love with the idea of a larger entry area with room to spare. I didn’t want to fill the space with a table and chairs, except when we intentionally want to use that space as a second dining room. So, this is really just the first phase of this room transformation. After the hardwood floors were installed (thanks Lowe’s!! ), I was eager to get a few things back in the room to start setting up the mood of the space. I brought in pieces I already had and combined them with a few other items that helped create the right mood. The new round rug from Pier One was especially perfect for bringing in color to balance the vibrant stain glass in the connected dining room. 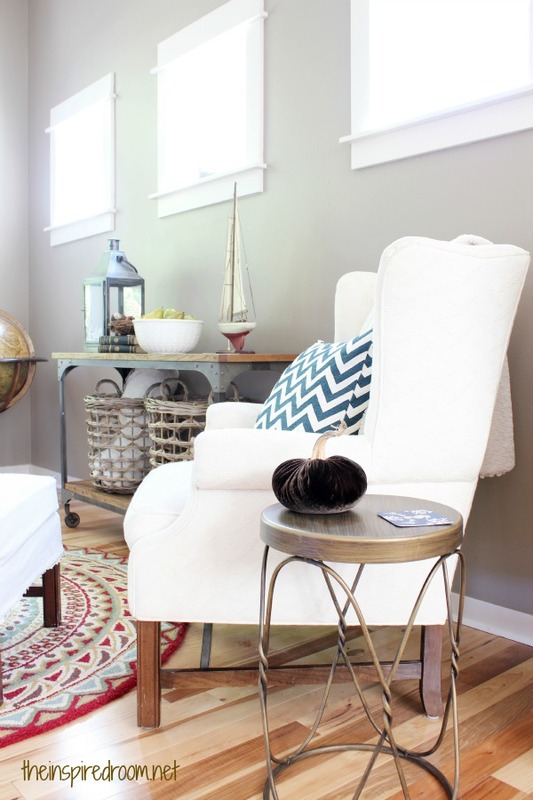 The rug anchors the sitting area and it also adds warmth and a touch of fall to the room. 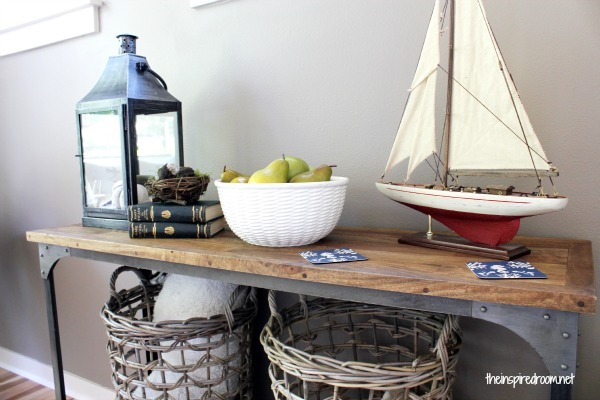 The console, baskets and small nesting tables are from World Market. 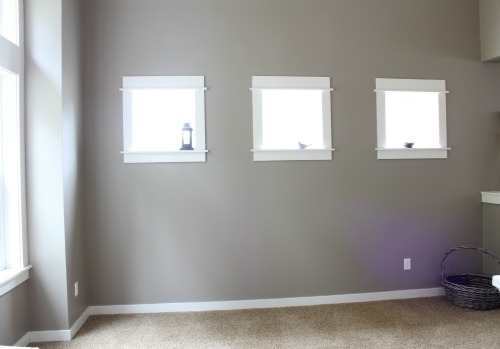 Eventually this room might have built-ins, hooks on the wall, perhaps a window seat. I have plans to add wood paneling to the ceiling and a few other details. But for now, I’m content to walk in and see a room that now sets the tone for our life at home. It is just what I need to love where I live! Have you thought about what you see when you walk in your front door? Does the view to the room inside your door energize you or zap your creative energy? Tomorrow, stay tuned for some sneak peeks of my sweet little plush pumpkins, with a giveaway and discount for you! Looks great! 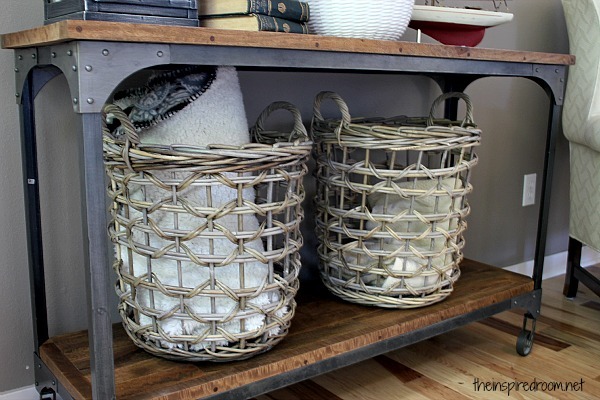 Did you get your console and those baskets from world market? What size r your baskets? Again, the change looks great! Thanks! Yes, forgot to mention that in my post but the table and baskets are World Market! I’m not sure on the size. I’ll measure later, I think it was their medium sized basket. I like the openness of it – very smart. 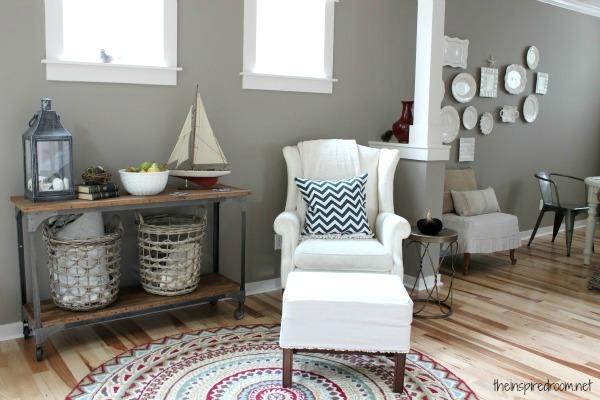 And that rug…oh my gosh! not only beautiful down there in that space, but even more so when viewed from up above. I do think about the view from the front door – and it is like I want it – a very warm and welcoming space, but most folks don’t come in my front door. That has been my problem – so the other door (which most folks use) opens into a hallway by the study (which is our disaster zone) and the laundry…not gorgeous places. Got to do something about the study! I love using every bit of my home. Your intentionality here is inspiring. Love the space! I’m also in the middle of a remodel and am second guessing everything I’ve done. 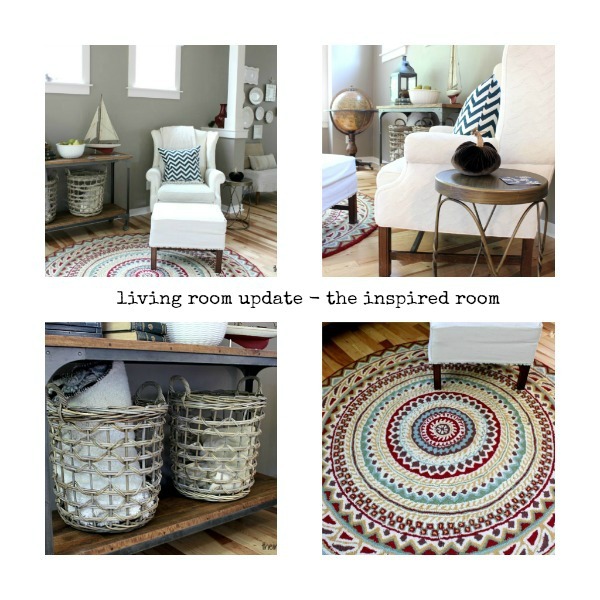 I love the round rug and would love to know where you got that! Thank you :-)! I found the rug and Pier One!! I was so happy to find a round one! just curious where the wonderful rug came from! I love it..and the room..
Driving from Texas today and sneaking in tonight to, um, “borrow” that wood and metal table! And, quite possibly, the rug. I don’t usually want someone else’s stuff, but that space is über fabulous! This room looks so pretty already — I can’t wait to see what else you have planned for it. :-) I love the little bench in front of the window right now! I love the console with baskets. Where did you get it? I’ve been looking for one like that for my entry. Those came from World Market! Ditto on the rug source. 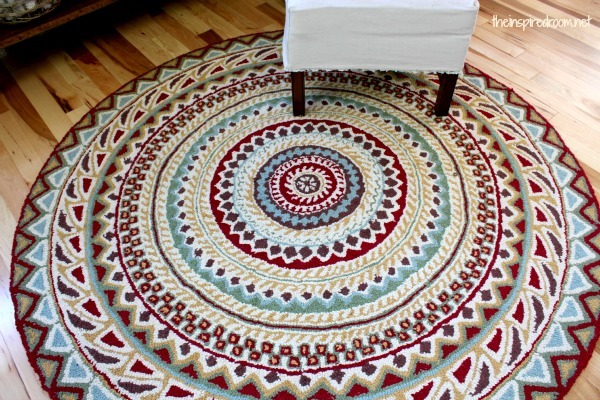 Beautiful rug! Kimberley – “Gazing Upon It” – that is exactly what happens in my home, as well, and now (thanks to your brilliance! ), there will be a name for it – thank you for the smile this morning!! I love this, “gazing upon it”. I was told once to do that in order to help with feeling anxiety over the huge to-do list. Finish something and then sit and enjoy the end result. Thanks for sharing this! Oh yes! That’s what we love to do at our house. “Come see what I’ve done!” And we all stand back and as you say, “Gaze upon it.” It’s a very good practice! Well said!!! I just have to say how much I love your blog and enjoy reading each post. Your approach to design is very, well, approachable and I appreciate the authenticity you bring. Melissa, I am so enjoying seeing your home evolve. I remember your old house, and I’ve been with you as you waited for it to sell, as you found your new home, and as you dreamed what you wanted to make it. And, now it is happening. I am smiling a big smile right along with you. You are making it happen – and it is fabulous! I know you are enjoying the process. Thank you, it has been quite a journey, waiting and dreaming and finally seeing this place evolve and become my home! And I’m so grateful to have people like you who’ve journeyed along with me :-)! Your encouragement along the way has been wonderful, thanks for smiling with me today :-)! Both an inspiring and thought-provoking post. I finally got a large mirror for my small entry hallway only to realize that it, like the rest of my decor, while nice and consistent with the architecture (mid-century, International) of my building just isn’t me. I’m a cottage girl in a downtown (San Francisco) world. 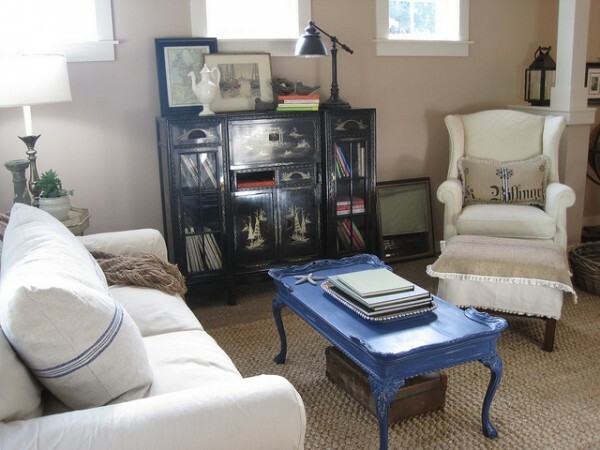 What I see when I walk in just hurts my eyes–>,<–contemporary whiteness with coastal touches. Something's gotta give. What's keeping me from making a home I love, no matter where I live vs. meeting some self-imposed standards from the imaginary Decor Police? Just say no to imaginary decorating police … you deserve a home you love! You don’t need a living room? Where do you sit together as a family? For tv or movie watching? The floors look fabulous! I really like the round colorful rug, too. Hi friend….I should be out milking the goats, but instead lingered over a cup of French press coffee – while reading this fantastic post. We actually did some shifts in this desert farm house – made the dining room the living room – made the family room the dining room – and we LOVE it. Our dining room seemed to shrink in size as our extended family grew! So we moved it all over and spread it all out into the living room, which served only as an occasional place to read a book. And the former dining room is now my office … love it all! Your new space is gorgeous! I love the openness of it. Add a small collection of books and that would be my favourite spot in the house ;-) I truly hate the view of my house when I walk in the front door. Our fireplace is straight ahead, but all you see is the side of it, with a weird off-centre impossible-to-decorate shelf above it. I think this is my first time commenting on your pretty blog. The spacious entry room is a great way to use that front room. Don’t we always congregate right by the front door when guests are arriving or leaving? I bet there is some old-fashioned word for that kind of room … receiving room, gathering room? 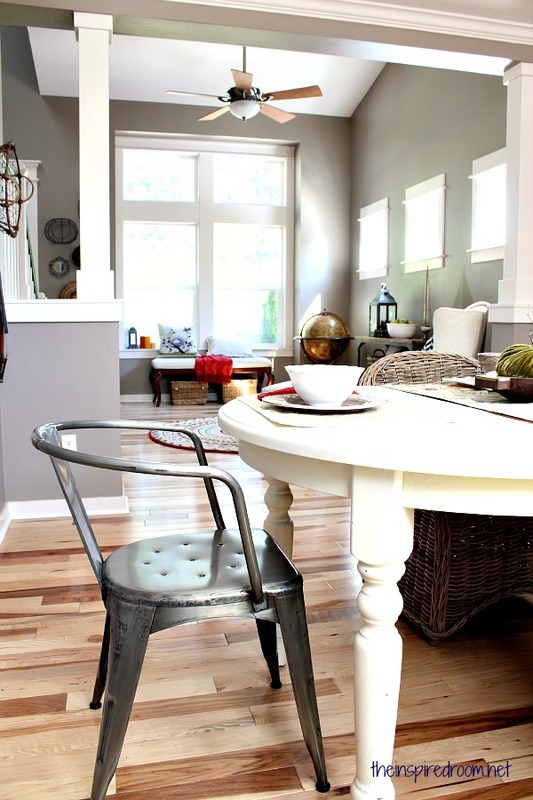 I love your hickory floors; I had those in my old house and would have done the entire house in them if I could have. So, so pretty with the lights and darks and knots and grain. Oh yes!! You are right, I love that! I’m going to call it the gathering room! I absolutely agree with you! I love what you’ve done with your front room! When we built our house, we scrapped the traditional “living room”…I didn’t want a fancy room thata we never sat in and that we never used! we turned it into liveable space (the sunroom) and now we LOVE it! The realtors at the time tried to tell us that the house would have less resell value…but who cares, I actually think times are changing and future owners will appreciate a house with more liveable rooms! You are creating a wonderful home for yourself and for your family. I love the intention of it all, and the way you have patiently (or impatiently) evaluated, waited, and then accomplished your goals. The new hardwood is so pretty, and the grey walls are lovely. Houses are to live in and yours is very liveable. Adorable! Tasteful, beautiful, and functional! Great job!! Would you mind sharing the name of the color of paint you used. I love that shade!!! Sure yes it’s a Behr paint, Studio Taupe. Thanks! Melissa…this is why I follow your blog…I have been doing the same thing in my house this year…after a couple of years of cancer and treatments I am in remission and re-evaluating our house and how we use it…last month saw a “cleaning out” if you will and a huge yard sale…now I am ready to rip up our carpets and get down the wood floors…my husband during all this has been quite accomodating – our kids are older and we definitely dont use our house the same way any more…I sent our dining room table and buffet to the basement which gives us alot more space in our living area – we only used it on holidays anyway and now our dining room is an extension of our livingroom with more seating – thanks for explaining your reasoning so eloquently – I’m going to show my husband your post and maybe now he will understand what I am trying to achieve with our whole house overhaul! Glad to hear you are feeling better and re-evaluating how you use your house! :-) It is a big project to overhaul a home but the end result will be worth the effort! This is exactly why I love your blog – your intentional decorating, for your family, for how you live. Timely for me since we are discussing this very thing. Our living room space, specifically. I’ve been thinking about how it feels when friends are over and we are sitting there talking, drinking coffee. Something doesn’t work and I want to figure it out. So it’s not just how a room looks but, more importantly, how it functions. (I love to state the obvious, I guess!) After being in this house for 25 years it’s way too easy to just go along with how it’s always been. Oh, and I love that rug, too! I knew when we moved in here last December that it would be a long time before we met the financial goals we wanted to meet before decorating the house to my taste. So I completely “finished” the small dining room at the entry, turning it into a restful place to sit with my husband and chat or read books. No matter what the rest of the house looks like, I can walk in to that space and breathe freely :). Also, as soon as people walk in, they see ME in the sitting room at least. The rest of the house I just savor the open-ness and big windows for now. And we are totally about making our space work for us — the “nursery” is in the walk-in closet of the guest room. Different? Yes. But it WORKS. Our “living room” has been on my mind for awhile. You have me thinking! So gorgeous! I love the rug especially. My living room walls are gray too and my house is neutral, but it really needs some life in the room and you have inspired me to work on it. I can’t get over the rug. I’m totally with you on evaluating your space and using it the way YOU would use it, not the way it’s meant to be. Stunning transformation. Such a happy space! I like my entrance to be intriguing (hopefully) so it makes people interested in what’s around the corner, I’d love to have all that breathing and relaxing space that your front room creates. Thank you for this article! I have been trying to decide what to do with my seldom used living room and this gave me some questions to think about. And I love the round rug!!! Where did you get it? Thanks! I got it recently at Pier One. I was looking for a round statement rug and was quite pleased to finally find just what I was envisioning! Love, love, love the rug!!! I’m redoing our living room and trying to figure out what works for us as well…you’ve done a lovely job. Your new changes are so inspiring. It’s so easy to get caught in a rut. You’ve surely spread your wings. The rooms have such a lovely fresh feeling. I used to think the ‘old’ living room looked nice. Not any more! What a stunning transformation. And the rug….perfect! It certainly does bring life to the space. Well done!!! Yes, I too believe that what you see is so important when one walks in from the front entry. It’s hard to pull off well in a small home. I’m learning less is more. It really is. I really like your wisdom in looking at your home as a whole and putting it back together because all the pieces need to fit together. 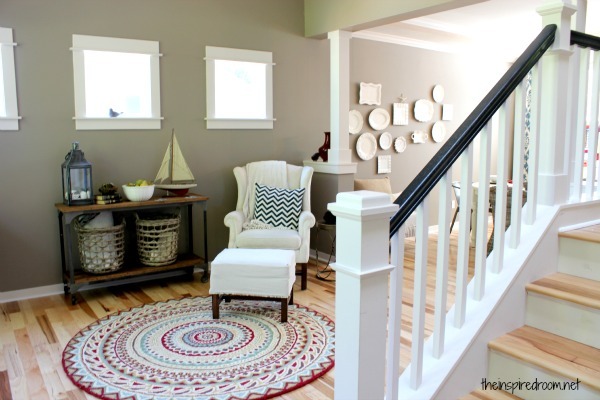 Also loved your statement about creating “spaces we love to come home to.” Your makeover looks wonderful! It looks great! I love how you’re thinking about how your family uses your home and the rooms. I have had the exact same conversation/thought process with myself for a while now. We also have a formal living space that basically never gets used. But as the first room you walk into in our house, I don’t really want it to be an office or craft space, though I would love to have those somewhere else! Thanks for the inspiration! Thank you for sharing the evolution of getting to know how you use space in your home. We have been in our house for almost four years and three of those it kind of looked like we just moved in! As a family, we enter up the stairs through our basement. If the steep stairs weren’t bad enough, we are greeted at the top by a peek into our boys’ bathroom; thankfully, the view is easily compensated for by simply shutting the door. Our front door, however, opens into the foyer which looks right into the kitchen. I keep our front door open most of the time, and it helps me to be intentional about at least cleaning off that portion of the counter which in turn makes me feel good. I love your mantra of making your home work for your family….it’s something we should all strive for. I have a weird entry way zone that I’m never sure what to do with. It’s been so many things, including a dining room, but, like you, I hate walking into a mess. We have a tiny house and the dining room also functions as craft room, office, and eating zone. I love the idea of having a beautiful space with a chair just for me :-) Thanks for the inspiration! Hi there. I found your blog through ourfifthhouse and I absolutely loved this post. Ive been reevaluating and reassessing the spaces in our home lately as well. I believe wholeheartedly in truly living in every square inch of a home. Just because spaces are spec’d as a particular area doesnt mean you actually have to use them as such. We have a large formal living and dining space as soon as you walk through our front door which NEVER got used so we are brainstorming on what to make them. We arent “formal dining” room kinda people so we are working on creating it into something our family will enjoy. I love your floors, by the way. I haven’t been to world market in so long..at least 18 months…your baskets are gorgeous, and I think I read in one of your responses to a comment that you got them there. It’s beautiful, Melissa! Wow! These are such beautiful updates. Especially the weave baskets and circular carpet! Can I ask where you bought the pillows? Thanks! Your house looks great! You are a terrific decorator!! My house is oddly configured and I’m not much into decorating, plus for holidays it’s just my hubby and I.
I LOVE the metal chairs at your dinning table! Please tell me where you got them! I also have wood paneling on my ceiling in my “front room” and we love it! Get so many compliments on it too! This post has re-inspired me to do a bit of a makeover as well! Thank you! Thank you!! I got them on sale recently at World Market! I love them :-) ! I love your intentional use of space. So many of us, me included, think our rooms have to work the way they labeled; “living room”, “dining room” etc. Given the price we pay for our homes, we should feel free to use the room as we need them, not as they are labeled on the blue prints… Speaking of which, we have come to the reality we are moving again… which means, the office I use daily, will have to be transformed into the bedroom on the “blue prints” so it sells better. Ugh!!! Hi Melissa, would you mind sharing the paint color in this room. It is the perfect shade of gray. I have the coffee table that matches your console from World Market. I love it! I love your doodles!! How adorable! I lost mine about a year and a half ago. She was the most incredible dog! I would love another. I miss her so badly but I can’t go through losing one again. My first and probably last dog! Ugh. Thank you for sharing yours with me. How fun it must be to have four! Great personalities. Your house is great too. LoL. Your dogs just stole the show for me! I agree with you on making your home fit your needs. We are going to axe our formal dining room. I swear I only use the table to fold the never ending dark clothes I seem to perpetually wash… or its where all the stuff we don’t know what to do with ends up.